665 pages : illustrations ; 22 cm. Told in two stand-alone stories, the first nearly 400 pages of continuous pictures, and the second in text. Inspired by the Dennis Severs&apos; House in London. Shipwreck survival--Comic books, strips, etc. Theatrical companies--Comic books, strips, etc. $c Statement of responsibility Brian Selznick. 500 General Note $a General note Told in two stand-alone stories, the first nearly 400 pages of continuous pictures, and the second in text. Inspired by the Dennis Severs&apos; House in London. 520 Summary $a Summary, etc. 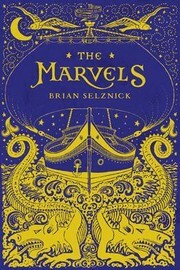 note The journey begins on a ship at sea in 1766, with a boy named Billy Marvel. After surviving a shipwreck, he finds work in a London theatre. There, his family flourishes for generations as brilliant actors until 1900, when young Leontes Marvel is banished from the stage. Nearly a century later, Joseph Jervis runs away from school and seeks refuge with a reclusive uncle in London. Albert Nightingale&apos;s strange, beautiful house, with its mysterious portraits and ghostly presences, captivates Joseph and leads him on a search for clues about the house, his family, and the past. 655 IT:Genre 7 $a Genre/form data or focus term History.